Our major equipment comes from Matrix Fitness — the world’s premier commercial fitness manufacturer. In the last two years alone, Matrix has received more awards for innovation than any other brand. Matrix Fitness equipment is characterized by superior industrial design, innovative ergonomics and high-end tubular construction. It’s all about ergonomics – Great ergonomic design ensures that each muscle group is properly isolated so that even a novice can exercise properly and safely. Why we offer the best equipment – You wouldn’t expect a value-priced club to offer the Rolls Royce of equipment. We don’t have to buy $9,000 treadmills, but with our 40 years’ experience, we know that it takes a solid platform to safely accommodate walkers and runners up to 500 lbs. Plus, higher-end equipment has less down time, delivers more value and provides higher member satisfaction and comfort. A better workout space – Our polypropylene, anti-microbial flooring is extremely durable, easy to clean and maintain, but has the comfort and beauty of carpet. We want to provide the highest quality fitness experience for our members and franchise partners. At Workout Anytime, everything we do is designed to put you on a successful, result-based journey to get you into the best shape of your life. If you prefer expert guidance and lots of encouragement, a Workout Anytime Personal Coach can help you perform your best. Our certified personal coaches provide personal and professional assistance so you can reach your goals in the shortest time possible. We have a variety of packages available to fit your needs including; one-on-one training, partner training (two people to a group) to small group training of up to six; depending on your preferences, budget and the level of support and assistance you require. 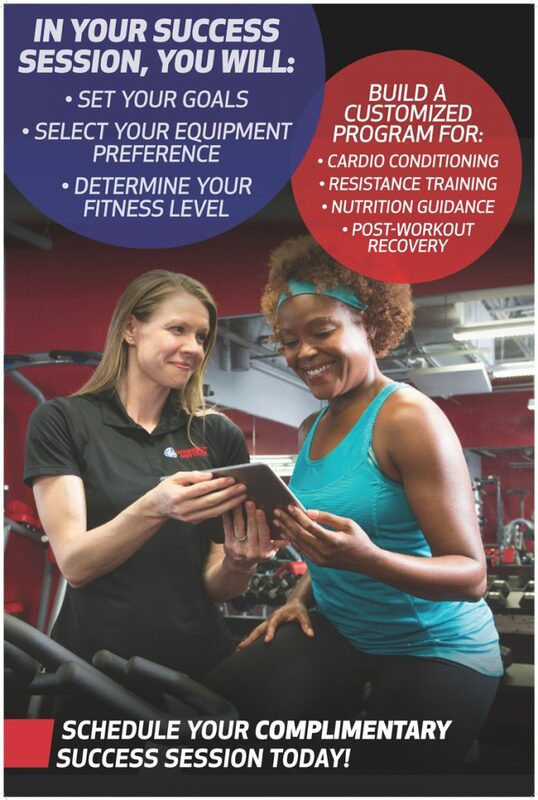 Our training team is there to work with you to develop an effective workout and nutrition plan based on your lifestyle, your current fitness level, and age. A personal coach will create a specific exercise routine for you and teach you proper technique and form. When you exercise with proper form, you reduce the possibility of injury while getting the maximum benefit from your workout. A personal coach will also help you achieve your goals. If you've always wanted to lose those last few pounds, tone up your body, or just be a healthier person but you haven't been able to get there on your own, a personal coach can help keep you on track. All new members receive a complimentary Success Session (up to one hour) with a personal coach ($120 value). The Success Session is the most important part of your membership — we've learned that members who take advantage of the session reach their goals twice as fast. With a Premium membership, you will enjoy a monthly evaluation as part of your program. If you would like to work with the coach on a regular basis, talk to any of our staff members to set up a schedule. In as little as 10 minutes, you can receive a relaxing, rejuvenating massage. HydroMassage is a comfortable, convenient, and affordable form of heated massage. With HydroMassage, a powerful wave of water spans the full width of your body providing a powerful, heated massage. You’ll enjoy total relaxation while remaining comfortable and fully clothed. Best of all, HydroMassage avoids the highly expense, messy oils and privacy concerns of conventional massage. Plus, it’s ultra-convenient. You can enjoy a quick massage at the end of your workout without needing to book in advance. But relaxation is not the only benefit of HydroMassage. Studies show that an invigorating massage after a workout helps stimulate circulation, which works to get blood to the muscles and help the body eliminate toxins. Note: HydroMassage may not be available in all locations. 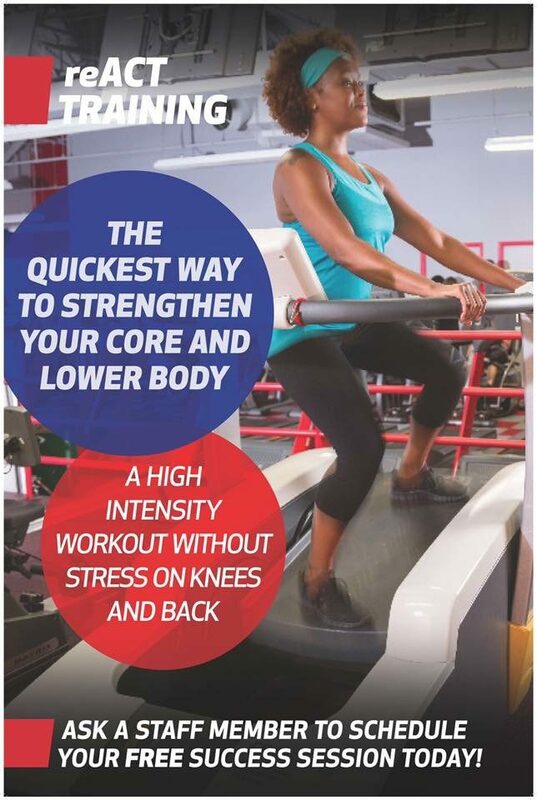 reACT's zero-impact technology is safe and effective for those with knee and low back issues, and provides rapid strength gains in just two 10-minute sessions per week. Choose intervals from 30sec to 5min at speeds of 30 to 70 rpm - That's up to 70 squats per minute! reACT is the first Rapid-Eccentric-Anaerobic-Strength and Core trainer that offers a high-performance quad workout, plus increased balance and stability training without the impact issues that come from running. Note: Many of our clubs are still in the process of installing the reACT training system. Ergoline Professional Tanning Beds – Workout Anytime offers tanning from Ergoline, the industry’s leading provider of professional tanning equipment. We make it easy to maintain a fresh-off-the-beach glow year ‘round with complete privacy. Preparing for Tanning – Before you use a tanning bed, make sure that you are prepared. Like going outdoors, you will need to have the right indoor tanning lotion to maximize and maintain your tanning results. You must also protect your eyes from the UV rays with tanning bed goggles. Best of all, a tanning bed is both relaxing and time-efficient. You can achieve that all-over glow in a fraction of the time it would take outdoors. Note: Tanning may not be available at all locations. .
TRX Suspension Trainer is a suspension performance training tool that leverages gravity and the user's body weight to complete hundreds of exercises.